The past 24 hours have stretched my sense of time. One morning I come across a report that in a far off cave in South Africa, scientists have discovered the bones of a previously unknown branch of the human family. A photo on the front page of The New York Times shows an ancient skeleton, neatly laid out from head to toe. The bones of the feet, according to one scientist, are “virtually indistinguishable” from those of modern humans. The finger bones are “extremely curved,” clearly adapted for climbing, and the skull seems to have sheltered a brain no bigger than an orange – one-third the size of a modern human brain. Named after the Rising Star cave in which the bones were found, these ancestors are called Homo naledi (“star” in the local Sesotho language). They walked the Earth more than 2.5 million years ago. I bow to my ancestors who lived nearly 3 million years ago. Somehow we are kin. The next morning I come across another report in The New York Times – this one placed not on the front page, but on page 10, as if the editor hoped to shield the reader from frightening news. A new study reports that burning all the world’s deposits of coal, oil, and natural gas would raise the global temperature enough to melt the ice sheet that covers Antarctica, along with the rest of the earth’s land ice. 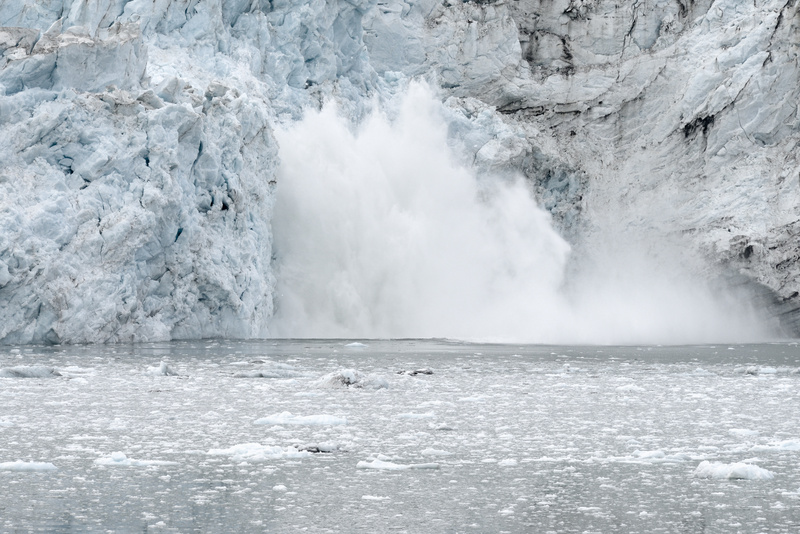 Sea levels would likely rise more than 200 feet. What takes my breath away is the list of the world’s regions that would be affected by a sea-level rise of 200 feet. The list of cities lost includes (among others) Miami, New Orleans, Houston, Washington, New York, Amsterdam, Stockholm, London, Paris, Berlin, Venice, Buenos Aires, Beijing, Shanghai, Sydney, Rome and Tokyo. I read the list of cities printed in The New York Times. I touch my fingers to the page, as if physical contact can help me absorb these facts and make them real. I recall the startling new report from James Hansen and 16 other top climate scientists, which predicts that significant sea level rise could be swift and abrupt. Oceans could rise as much as ten feet in as little as 50 years, which means that we would lose all the coastal cities of the world. The people living in those ruined cities could include my beloved children and grandchildren. I don’t need to exercise any imagination or empathy to know what these people will be like. They will be just like us. They will search for food when they are hungry, and they will weep when they are sad. They will look for shelter and safety in a difficult world, and they will care for their nearest and dearest. I know in my bones that we are kin. That night I go outside and stand barefoot in the backyard. The toes of my feet, not so different from those of Homo naledi, dig into the cool grass. Where am I in time? Behind me, in the past, extend some 3 million years of human evolution. Ahead of me lies a human future that could be unimaginably chaotic and short. Here, in this precious, passing instant of time, I stand on the place where past and future meet. That place is on fire with love. Surging through the dark night air and rising up from the earth beneath my feet are gratitude for the priceless gift of life, grief for what we’ve lost, anger at what we’ve done, and a love that knows no bounds. I feel an urgent call to spend my life well, to place it in the service of life. 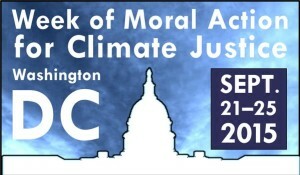 Next week I will head to Washington, DC, to participate in the Week of Moral Action for Climate Justice (Sept. 21-25). Pope Francis is coming to DC to address a joint session of Congress, and people of all colors, creeds, and faiths will converge on our nation’s Capitol to amplify his unequivocal call to humanity to create a just and sustainable future. All eyes are on the U.N. climate talks that will be held in Paris this December, which we fervently hope will chart a course to a low-carbon world. The Pope’s encyclical, Laudato Si’ (Praise Be to You), draws from the best of the Judaeo-Christian tradition. As Wen Stephenson points out in a fascinating cover story in The Nation, the encyclical reclaims the once-marginalized terrain of liberation theology and offers a radical critique of the economic and social system that drives climate change. Francis highlights the fact that in a world beset by a disrupted climate, those who are poor have the fewest resources and are the least able to adapt. What’s more, the same mindset and economic system that exploit the Earth are the same mindset and economic system that exploit the poor. 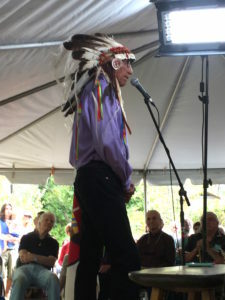 The cry of the Earth and the cry of the poor form a single cry and should evoke an integrated, comprehensive response. The encyclical itself has generated a strong response: negative reviews from right-wing politicians wedded to the fossil fuel status quo and ringing endorsements from religious leaders worldwide who view climate justice as a moral imperative. 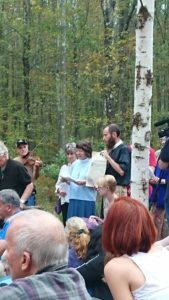 More than 400 rabbis have signed a Rabbinic Letter on the Climate Crisis that was timed to support the papal encyclical. Islamic leaders from 20 countries recently released the Islamic Declaration on Climate Change, urging action based on a religious mandate to protect the planet. 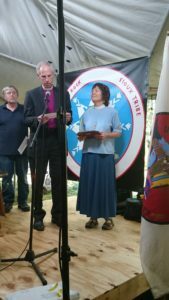 Anglican bishops just issued a fresh call for action on climate justice. During the week in DC I will offer a prayer at the National Prayer Breakfast for Creation Care, hosted by National Religious Coalition for Creation Care (NRCCC), and I will offer a prayer at the Interfaith Prayer Vigil near the National Mall that concludes the marking of Yom Kippur, one of the holiest days in the Jewish calendar, and a day of atonement. I will walk through the halls of Congress, delivering copies of a letter about the climate emergency that I took the lead on writing on behalf of NRCCC, and I will stand with thousands of people on the National Mall to watch on Jumbo Trons as the Pope delivers his message to Congress. That night I will savor a celebration of song, prayer, sermons, and poetry about faith and climate at the National Cathedral, which will be live-streamed nationally. In the short span of a lifetime each one of us has countless opportunities to bear witness to what Dante called “the love that moves the sun and other stars.” That love is moving through us, too, and in the brief time we Homo sapiens have left in which to save life as it has evolved on this wondrous planet, it is our call and privilege to do everything we can, because we love our natural world and our descendants, those born and not yet born. They are our future and we are their past. So we reach out to the ancestors who came before us and to the descendants who, God willing, will arrive long after we have vanished from Earth and are only bones in the ground. We reach out to our human neighbors, to children and the elderly, to the vulnerable and poor, to the countless refugees already on the move as seas rise and drought spreads. We reach out to the living world around us – to all that has been desecrated, to the blasted forests and dying meadows, to the poisoned, acid-drenched oceans and the convoluted air. We reach out in love to all of you, and we say: I stand with you. I belong to you. I am part of you. I will not let you go. We are in this together. I will join the fight to re-weave the web of life. 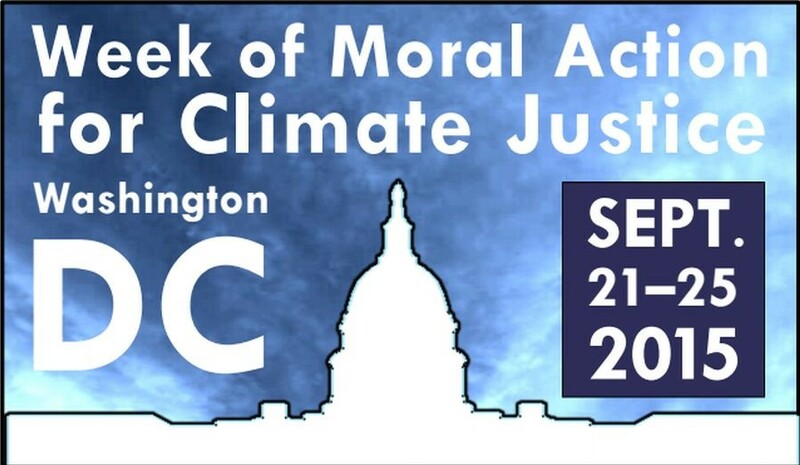 The most comprehensive schedule I’ve found for the events going on in DC during the Week of Moral Action for Climate Justice is here. September 21: The National Prayer Breakfast for Creation Care will begin at 10 AM, at Capitol Hill Lutheran Church, 212 East Capitol St NE, Washington, DC 20003. September 23: Interfaith Prayer Vigil will begin at 7:00 p.m. near the National Mall at John Marshall Park (at Pennsylvania and 4th Street NW, near Judiciary Square Metro), organized by Franciscan Action Network. September 24: Ignatian Solidarity Network is helping congregations to organize “watch parties” of the Pope’s historic address to Congress, offering a free step-by-step guide for how to set one up. Three watch parties are scheduled at 7:00 p.m. in the Pioneer Valley (in Amherst, Northampton, and Longmeadow, MA). Details are here. At 12:30 p.m. on September 24, the same day that Pope Francis addresses Congress, Springfield Climate Justice Coalition will hold an important rally on the steps of the Springfield, Mass. City Hall, to urge the city to fund and implement a climate action plan. Download a flier here: SpringfieldRallyForClimateJustice2015flyer. Please come if you can! Friends, it is good to be with you this morning. Thank you, Cat, for inviting me to preach. I serve the diocese as your Missioner for Creation Care, so I travel from church to church, preaching the Gospel and speaking about our call as Christians to heal the Earth. I am blessed by the timing of this invitation to speak, for across the U.S. this weekend Americans are celebrating the life of Martin Luther King, Jr., a man who gave his life, quite literally, to the quest to heal our country’s great racial divide, and who dreamed of a world in which men and women of all races could live together with justice and mutual respect. Racism and racial justice is of course a vital issue in our country right now, a topic of intense debate as we observe in several cities the tragic tensions between some white police officers and the people of color that they were sworn to protect. Across the country people are exploring hard questions about white privilege and institutionalized racism, about how far we have come as a society and how much farther we have to go before we finally manifest what Dr. King called the Beloved Community. 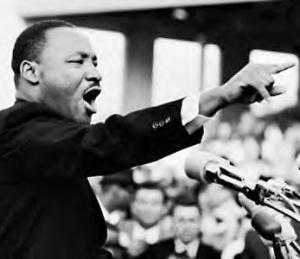 Dr. King recognized that race relations do not exist in a vacuum. He understood that racism intersects with other patterns of violence, including poverty and militarism. If he were alive today, I believe that Dr. King would add a fourth item to what he called the “triple evils” of poverty, racism, and militarism. To that list I believe that he would add environmental destruction, especially human-caused climate change. For unless we stabilize the global climate and rapidly reduce our emissions of greenhouse gases, we will unravel the web of life and destroy any possibility of Beloved Community for human beings and for most of the other beings with which we share this precious planet. The struggle to end racism is linked to the struggle to end poverty, the struggle to end war, and the struggle to protect life as it has evolved on Earth. Racial justice, social and economic justice, environmental justice, climate justice – all these struggles intersect. In the end we share one struggle, one dream, one deep and God-inspired longing: the desire to build a peaceful, healthy, just, and sustainable world. It is God who whispers that dream into our hearts, God who plants that longing in us like a seed that grows into a mighty oak, God who stirs us out of our complacency and sends us into action. It is God who gives us a heart to care, and strength to keep fighting the good fight. For it can be difficult to keep going, difficult to keep the faith in the face of sometimes brutal opposition and the sheer inertia of business as usual. There is a wonderful scene in the movie Selma, a movie that I hope you will see, if you haven’t already. The movie is set during the turbulent three months of 1965, exactly fifty years ago, when Martin Luther King, Jr. was leading a campaign to secure equal voting rights. Early in the movie we see David Oyelowo, the actor playing Dr. King, awake at home late at night, restless, anxious, and acutely aware of the threats against his own life and against the lives of his wife and children. Should he keep going and head to Selma? He is resisting the powers and principalities of this world and he has reached the limit of his strength. In that late-night hour he picks up the phone, dials, and says to the person on the other end of the line: “I need to hear the Lord’s voice.” The friend he has phoned is the legendary Gospel singer, Mahalia Jackson, and into the phone receiver she begins to sing very tenderly, “Precious Lord, take my hand.” It is an intimate moment, as intimate as the moment recorded in this morning’s first reading, when late at night the boy Samuel hears the voice of God speaking his name in the darkness (1 Samuel 3:1-10). When God speaks to us in that intimate way, often without any words at all, we feel mysteriously addressed. In that quiet, intimate encounter we feel known by name, touched very personally by a loving power that sees us, knows us through and through, loves us to the core, and gives us strength to carry on. This is the experience of the psalmist who writes – marveling and full of wonder – “Lord, you have searched me out and known me; you know my sitting down and my rising up; you discern my thoughts from afar” (Psalm 139:1). This is the experience of Philip, who hears Jesus call him to follow, and of Nathaniel, who realizes that Jesus saw, and knew, and thoroughly understood him even before they’d met (John 1:43-51). As Christians, we open ourselves to be seen and known, loved and guided by an intimate, divine presence that will never let us go. That is what prayer is, and it gives us strength. And when we’ve lost touch with that divine presence, when we feel frightened, despairing, or overwhelmed, we rely on each other to help us find our way back to God, just as Philip helped Nathaniel, as Eli helped the boy Samuel, and as Mahalia Jackson helped Dr. King. As people of faith, we are in this together, and when any of us lose heart, we try to help each other, as individuals and as a community, to turn again to God and to make our appeal: Precious Lord, take my hand. I feel as powerfully as ever that call to prayer, that call to community, and that call to active, faithful service and advocacy. I don’t usually carry a newspaper into church – actually, this is the first time I’ve ever done it. But I want to show you the front page of yesterday’s New York Times, which gives a map of the world colored in shades of red to indicate all the areas that were above average in temperature last year. The year 2014 broke the record for the hottest year on Earth since we started keeping records. But hey, we may be saying to ourselves, it’s been so cold in New England! It turns out that below-average temperatures in our region may be indirectly linked to climate change. Some scientists are studying the likelihood that the unusual dips they are noticing in the jet stream are connected to the rapidly warming Arctic and the exceptionally warm waters of the Pacific Ocean. 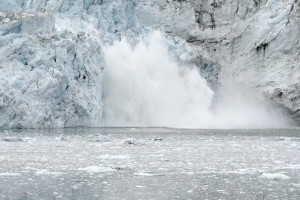 Bottom line is that the phrase “global warming” is probably much too simple – a better term might be “global weirding.” As the world grows warmer we can expect more erratic and extreme fluctuations in local weather, and some places will sometimes become unexpectedly cold. Yet all the while the average global temperature is heading in only one direction: up. In just two centuries – a blink in geologic time – we have burned so much coal, gas, and oil and released so much heat-trapping carbon dioxide into the atmosphere that levels of carbon dioxide in the atmosphere are higher today than they’ve been for hundreds of thousands, maybe millions, of years. I heard a climate scientist say, “We are breathing from an atmosphere that none of our ancestors would recognize.” Sticking to business as usual could raise average global temperatures between 5 and 11 degrees Fahrenheit in this century. That may not sound like much, but in fact it would make the world extremely difficult for humans and other creatures to inhabit. Oceans are already heating and becoming more acidic; tundra is thawing; ice caps and glaciers are melting; sea levels are rising; coral reefs are dying; massive droughts are spreading in some places and heavy rains are intensifying in others. Last spring we learned that the huge West Antarctic ice sheet is starting to collapse and slide into the sea in a way that scientists call “unstoppable.” The latest climate report from the U.N. warns of food shortages, waves of refugees, and the mass extinction of plants and animals, if we keep to our present course. This is the sort of news that wakes me up at night and pulls me into prayer: precious Lord, take my hand. It is also the sort of news that propels me out of bed in the morning, eager to find a way to be of use. 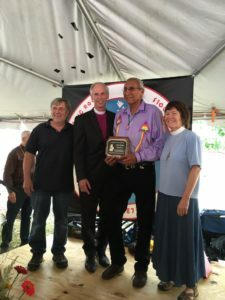 Once we have grasped what the bishops of the Episcopal Church call “the urgency of the planetary crisis in which we find ourselves,”1 there is so much we can do, so many ways that we can contribute to the healing of Creation. Thank you for the work you’ve done here at St. John’s to conserve energy, switch to efficient light bulbs, and use cloth rather than paper napkins. Our individual actions add up: we can recycle more, drive less, be sparing in our use of water, quit using bottled water. We can turn off lights when we leave a room. Maybe we can eat local, organic foods and support local farms and land trusts, maybe even leave them some money in our wills. I hope you’ll form a “green team” in this parish, and name a Creation Care Minister. I hope you’ll sign up to join a network of people in the diocese who care about Creation. I’d be glad to support you in any way I can. 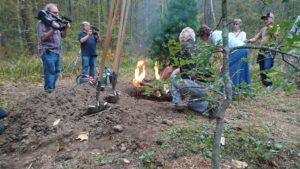 I also hope you’ll sign up to receive a weekly newsletter from the grassroots group, Climate Action Now, which is centered right here in the Pioneer Valley. If we work as isolated individuals, our success will be limited, for the scope and speed of the climate crisis require action on a much broader scale. So we link arms with other people and we join the movement to make it politically possible to do what is scientifically necessary. The climate movement is gaining momentum, and many of us are inspired by Dr. King and the civil rights movement. 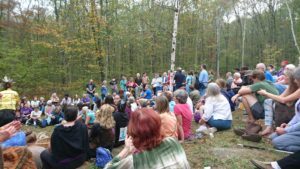 Last week I spent a day in Amherst with other local climate activists, studying the principles of non-violent civil disobedience as practiced by Gandhi and Dr. King. Along with more than 97,000 people across the U.S., I have signed a pledge of resistance, a pledge to risk arrest in non-violent direct action if the Keystone XL pipeline is approved. 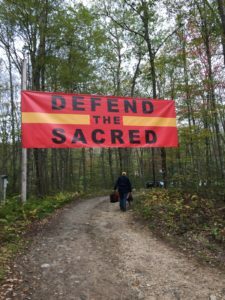 Stopping that pipeline has become a powerful symbol of the urgent need to keep 80% of the known fossil fuels in the ground, where they belong. Fossil fuel companies now possess five times the amount of coal, gas, and oil that, if burned, would force the average global temperature to rise far higher than the 2 degree threshold that gives us a 50-50 chance of preventing runaway climate change. So now is the time to make a swift transition to clean, safe, renewable energy, such as sun and wind. In this unprecedented time, many of us feel called anew to listen to the tender voice of love that God is always sounding in our heart, and then to embody that love in the world as bravely and clearly as we can. If ever there were a time to bear witness to our faith that life and not death will have the last word, now would be the time. If ever there were a time to take hold of the vision of a Beloved Community in which human beings live in right relationship with each other and with all our fellow creatures, now would be the time. The collapse of the ice sheet in Antarctica may be “unstoppable,” but so is the love that calls us to stand up for life. Archbishop Desmond Tutu fought for racial justice and against apartheid in South Africa, and now he is one of the world’s champions of climate justice. Reconciling human beings to each other, to God, and to the rest of Creation is what Tutu calls the “supreme work” of Jesus Christ. Thank you, my brothers and sisters in Christ, for joining me in that supreme work. 1. In 2011 the bishops of the Episcopal Church issued a pastoral teaching on the environment that begins with a call to repentance “as we face the unfolding environmental crisis of the earth.” For the full text of “A Pastoral Teaching from the Bishops of the Episcopal Church,” meeting in Province IX, in Quito, Ecuador, September 2011, visit here.